But things have changed over the last few decades. Since 1960, Nepal’s population has grown from 9.5 million to more than 27 million, nearly 80 percent of which is rural. At the same time, deforestation and water use have increased. In 1978, the World Bank warned that water in the foothills could be depleted in 15 years. 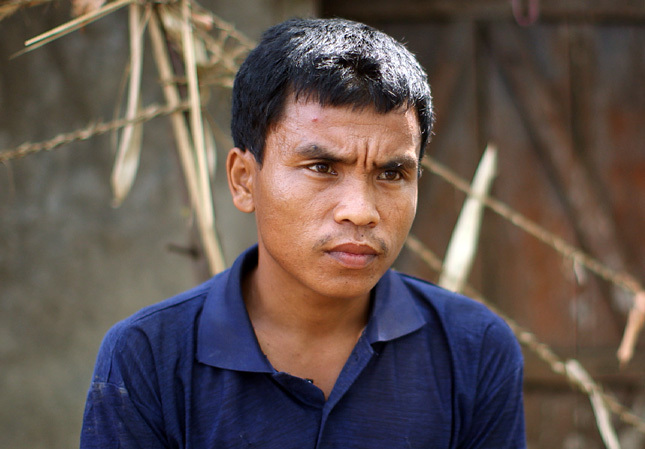 Each move by the nomadic Chepang led them to more marginal land and trickier terrain. One of Nepal’s most marginalized ethnic groups, the Chepang have their own language, spiritual customs, and traditional knowledge system. Partly because of this societal isolation, they have lower literacy rates, access to government, and development aid than most other groups – in an already impoverished country. But one small NGO, RIMS Nepal, has been working with the Chepang since 2000. 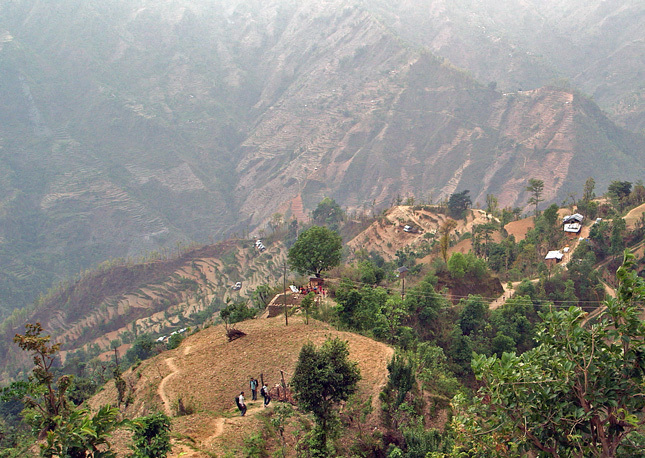 And in 2006, RIMS began implementing a community-based, population, health, and environment (PHE) approach to development in two villages in the district of Dhading. Along with videographer Michael T. Miller of Think Out Loud Productions, I recently visited these communities to film ECSP’s second documentary in a series featuring PHE projects from around the globe. Scaling the Mountain: Protecting Forests for Families in Nepal is set to premiere at the Environmental Film Festival in the Nation’s Capital on March 25. Standing on a ridge in the village of Jogimara high above a deep valley, I found the idea of moving every three years to the next mountainside in search of land to cultivate, wood to harvest, and water to drink daunting, to say the least. All around me, terraced hills and farmland were gaining ground along forested ridges. It took a two-hour climb by car and then an hour-long hike to meet Aitimaya Chepang, a “peer educator” trained by RIMS Nepal, and her neighbors in this small settlement with little electricity and no running water. In Jogimara, wood is collected every day for cooking and heating, as it is in the vast majority of rural Nepalese households. Naubise, a nearby village, depleted the surrounding forests so much that residents had to walk five hours to the nearest source of firewood. The extra time collecting wood put a tremendous burden on the villagers in Naubise, while Jogimara’s residents found that continuing to move from place to place was becoming harder and harder. But Aitimaya and other community leaders had an intense passion and drive to address the community’s multi-faceted challenges. Their best hope for progress and growth, they found, was an integrated solution. Serious concerns about deforestation in Nepal first arose after the World Bank report in 1978, Kashav Raj Kanel, former director general of the Department of Forests in Nepal and director of RIMS Nepal, told me. “What we have observed,” said Kanel, “is that villagers in some localities were managing forests in their own way.” As a result, the government sanctioned new local organizations called community forest user groups. These groups allowed communities to have a say in the use, distribution, and protection of their local resources. As the community groups began to take root, they became important grass-roots level institutions for governance issues beyond natural resources, including peacebuilding. RIMS saw the development of these local governance structures as an opportunity to introduce the population, health, and environment (PHE) approach to Jogimara and Naubise. PHE is a loosely defined model of development that combines interventions that promote reproductive health, natural resource management, and sustainable livelihoods. (ECSP’s first film, Healthy People, Healthy Environment: Integrated Development in Tanzania, highlighted a PHE program in a coastal community grappling with a similar set of problems.) PHE programs are prominent in areas of high population growth, low access to health services, and high biodiversity, like parts of East Africa and the Philippines, and also frequently include strong gender-empowerment, water and sanitation, and food security components. In Nepal, RIMS trained peer educators – like Aitimaya – on the links between forest health and community health. Along with female community health volunteers, RIMS-trained peer educators worked closely with government health clinics to fill the gaps – both in distance and knowledge – in the health concerns of their neighbors, including family planning. The depletion of local resources has also abated. In both villages, people praised the work of RIMS and the PHE approach for helping to preserve and replenish their local forests. Naubise residents now have a much shorter trip to get firewood and were cultivating their farms in a more sustainable fashion. The Chepang of Jogimara feel less pressure to leave. Other parts of Nepal that have developed community forestry user groups have also seen deforestation decline and soil and water quality improve. As community forest user groups combine with locally trained PHE staff and community health volunteers, the connections between managing the local environment and improving family health are spreading. “The Chepang community has changed a lot,” Aitimaya told me. She now talks openly with her neighbors about the importance of preserving the forest and where to find the health services they might need. A conversation has started, and the cycle of depletion and migration may be coming to an end. Even as the RIMS initiative is coming to a close (since my return, the NGO appears to have largely dissolved), the community-based nature of PHE means the approach has a good chance of continuing. An awareness of the importance of managing natural resources alongside human health may be as important a result as any, because for Jogimara and Naubise, change is not likely to stop. ‘Scaling the Mountain: Protecting Forests for Families in Nepal’ premiered at the Environmental Film Festival in the Nation’s Capital on March 25 and is available at newsecuritybeat.org/scalingthemountain. Sources: Environmental Law Institute, International Fund for Agricultural Development, MEASURE Evaluation Population and Reproductive Health, Program on Forests, UN Development Program, UN Environment Program, UN Population Division, UN Resident and Humanitarian Coordinator’s Office, World Bank. Photo Credits: Sean Peoples and Michael T. Miller/Wilson Center.